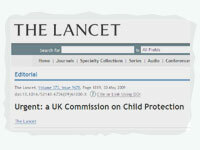 The baby Peter case and other child abuse scandals have sparked calls from The Lancet for a national commission to deal with the “disastrous mess” in child protection in the UK and Ireland. In an editorial comment in its latest edition, the medical journal said three major cases last week had “made a mockery of child protection by further adding to the confusion around how best to protect vulnerable children”. The Lancet referred to the second serious case review into the death of Baby P, and the decision by the High Court to uphold the General Medical Council’s ruling to strike off paediatrician Dr David Southall for allegedly accusing a mother of killing her son. It also pointed to the final report of Ireland’s commission into child abuse. According to The Lancet, “no amount of reflex retribution, retraining and tinkering around the edges” would be enough to fix the child protection system, and there was “clearly no overall consensus among professionals on how best to serve children”. One group of paediatricians and child protection workers believed earlier involvement of police may be required in cases involving deceptive perpetrators, it said. But authors of a series of reports in The Lancet had argued for a “comprehensive child and family welfare approach”, and said earlier police involvement might cause more harm to children from “chaotic and incapable families with social instability”. Shaun Kelly, head of safeguarding at charity Action for Children, hoped the creation by the government of the National Safeguarding Delivery Unit would help all child protection staff to “work together more effectively, build on good practice and promote excellence across the board”. “Investing in our social workers and other professionals will ultimately help keep vulnerable children safe from harm,” he added. A spokesperson for the Department for Children, Schools and Families said it was “disappointing” that The Lancet had “failed to acknowledge” the National Safeguarding Delivery Unit and Social Work Taskforce, plus £58m to support and develop social workers. The unit would “drive continuous improvement in frontline practice across all services, and provide support to every local authority and every children’s trust as they fulfil their safeguarding responsibilities”. Meanwhile, the NHS was starting to review arrangements for safeguarding children. It follows a request in December 2008 by NHS chief executive David Nicholson to local chief executives and boards. The DSCF is also “completing preparatory work” in the Southall case before reviewing case files that the attorney general said it should examine. The review should focus on 82 special case files kept by Southall that are linked to court proceedings of some kind, to identify which of those had links to family proceedings. What can we expect from the social work taskforce?